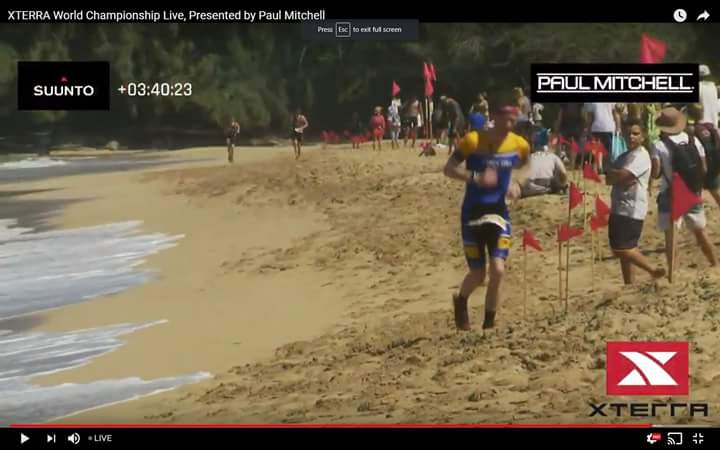 It's funny how perspectives change over the years.....two years ago at the 2015 Xterra World Championships it was first year in Xterra and I was sort of just pleased to be there and taking it all in. I was pleased with my race.....fast forward two years and I had larger goals and put more expectations on myself. Leading into the race I had trained well, was feeling fit and knew that if I had a good day a top 15 position and something around 3hrs 15mins (on a dry course) was in the realm of possibility. I had learned the hard way in 2015 about flying for 12 hours and trying to pre-ride the course so changed the approach this year. I was helped that some major rains in the days before us arriving had made a bog of the course and that meant the course was closed on Thursday. With the heat and winds, the course reopened on Friday and I barely had to wipe the bike down....race day was going to be a dry and dusty course! 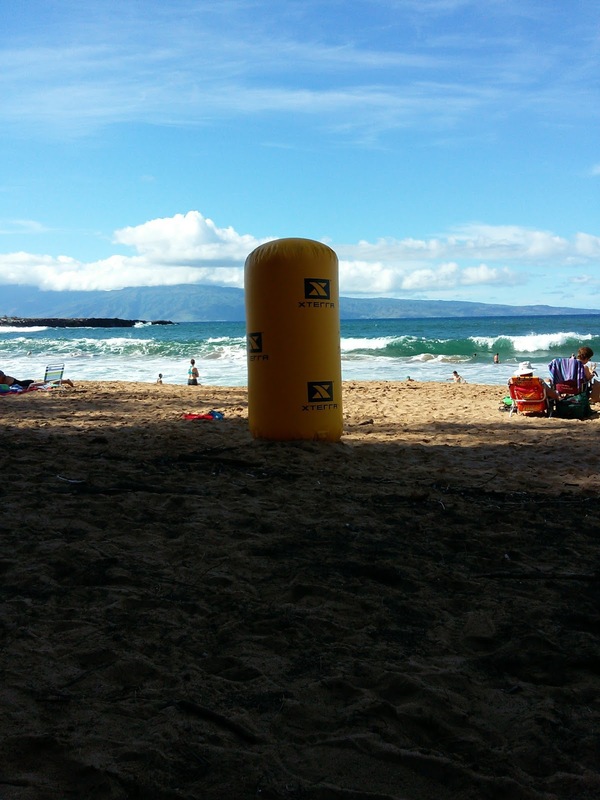 The rain and winds had also brought a huge swell meaning that the shore break was ripping the first few days we were there and subsided a little by race day.....it was still pretty cool to have to fight out the past the break on race day. The swim went well and I was out in just over 26mins, much the same as 2015. 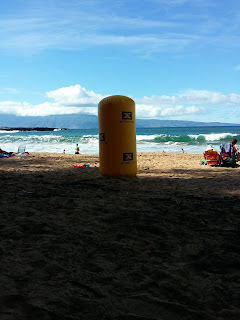 Yet again I didn't see any turtles during the swim, perhaps they were deterred by the swell! The run to T1 is all up hill and is quite long as far as transitions go. It was at this point that I actually felt quite fatigued and more so than normal. In hindsight it probably came from the battling of the swell and waves more than anything else. It was onto the bike and the goal to go as hard as felt comfortable knowing a) the elevation gain on the course but also b) the upcoming run. It that respect I nailed the bike....did I have the time I wanted? No, a few minutes slower but it was faster than 2015 by 5 mins and I was at an average of 148bpm for the duration. Nutrition was spot on with Gu Energy Roctane drink mix and gels and bottles of on-course water. 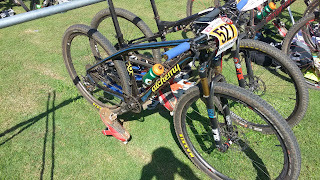 The bike set-up with the Alchemy Oros and Maxxis tires (Ardent Race on the front and Ikon for the rear) was perfect and I wouldn't change anything there....for reference I rode a 32t Elliptical Chainring with an 11-42 rear cassette. Course conditions were spot on and had dried well after the rains. Based on the swim and bike, I had to have a great run to get close to 3hrs 15mins....and straight out of T2 I knew that wasn't going to happen. The call down the engine room came back with a resounding "negative Captain" and unfortunately the Maui run course isn't something that you can gradually work your way into. It's uphill for the first 3 miles and not a gradual hill at that......it was a death march for the entire 10km. So here's the how the perspectives change over the years....in comparison I was 2mins 30secs slower than 2015 and in 2015 I was pleased with my race, in 2017 not so much. However, my main goal was to go and give it everything knowing that sometimes you have to take risks to achieve things....I went hard on the bike and it ended up being to my detriment on the run. But I knew I had to do that to get close to that top 15 position and the risk was bombing the run and that lead me to a 34th position. On the bright side I was still at the World Championships, something that not many people can say and ended up top 25% in the World! 1. Travel to the race sooner.....the time change really screwed with my body clock. I was waking up everyday at 300am after poor sleep and it wasn't until after the race some 5-6 days later that I got onto Hawaii time. I would go a week beforehand. 4.Make more of an effort to run outside - as many know about 95% of my running is on the treadmill at work during the lunch hour....it is fundamentally different to running outside and also limits my runs to 45mins or less! 5. This comes after every race.....swim more! All that aside.....the race was awesome, we had a great time at the race and afterwards in Maui and as I stated earlier we will definitely be back to take another crack at the course!